Height 47 cm. Saint Petersburg, The State Hermitage MuseumInv. No. П. 1911.12. Found at Kertsch in 1911 on Mount Mithridates. Representation of a player of the double flute or aulos (oboe) participating in a contest. In the third year of the 48th Olympiad, the solo aulos was introduced into the Pythian Games. The musician, standing on a podium, wears a long white mantle, the hem of which is richly decorated. He is holding the double flute at shoulder level and turning towards the right as he plays. On either side stands a man wearing a himation and leaning on a staff. On the B side of the vase there appears the goddess Athena. 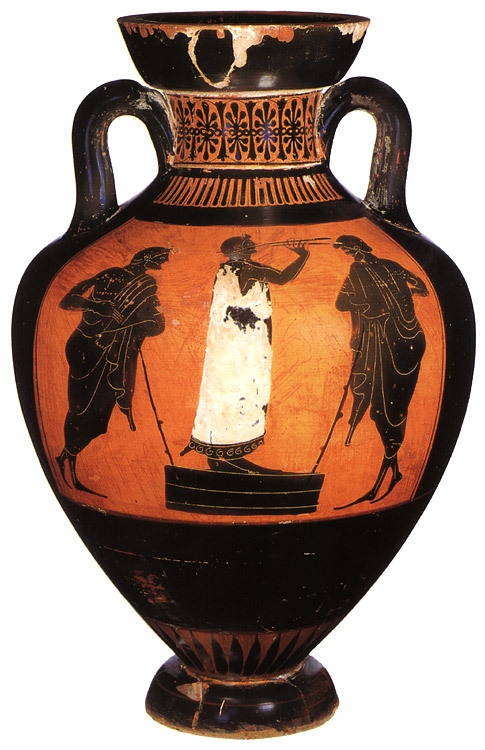 This means that the amphora was awarded as a prize to the winner of this musical contest at the Panathenaia. IAK, no. 45 p. 76. K. S. Gorbounova — A. A. Peredolskaya, Mastera Grecekich raspisnich vas (Leningrad, 1961) p. 18. © 1993. Photo, text: Olympism in antiquity. Olympic Museum Lausanne. Bertelsmann UFA. Industria Gráfica S. A. Barcelona, 1993, p. 70 cat. no. 13.